It seems everyone is in a partying mood lately, what with the first birthday of the New Order being celebrated this week. And few are enjoying the fesitivities more than Erotica 1. 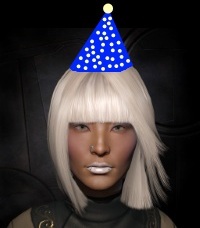 She already owned 12,000 shares, but the New Order's birthday made her want to do what she does best: Isk-doubling. Her jaw-dropping purchase of an additional 12,000 shares put us over the 94, 95, 96, 97, 98, 99, 100, 101, 102, 103, 104, and 105 billion marks. Now Erotica 1 is back on top of the shareholder list as the single biggest owner of shares. More importantly, Erotica 1 earns an unprecedented, record-mutilating Duodecuple Supreme Protector's Tip of the Hat™. It's amazing to think that the New Order has sold over a hundred billion isk worth of shares. That's twelve figures! It's fitting that the entire highsec community, including the isk-doublers of Jita, are rallying around the New Order. Doesn't that warm your heart? 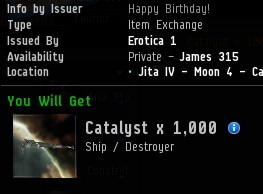 12B ISK + 1000 Catalysts?!? I think my next Catalyst will be named after Saint Erotica. Saint Erotica. Patron saint of hisec gankers and of emergent gameplay. Absolutely deserving of the title "Provider and Benefactor of the New Order." Erotica 1 takes money from the stupid to give it to the heroes! She's justice incarnated! The scammer scams the scammer. At times I ask myself how it's possible that people still fall fro obvious scams in EVE, but then guys like this one remind me that many can't yet understand what a scam is. Do you also think that when you donate money to twitch tv streamers you enjoy and support you're getting scammed? If that hat were an in game item I would buy you some. Even it it was only available for real money. Our catalysts will blot out the sun! Looks like Erotica 1 is beautiful, rich and smart too: definitely marriage material! We should buy a Gank Titan! do they come in concord-proof flavours? Saint Erotica! May she ever be known! I once again thank you for enabling my play-style.